1 GB Module for 12" AlBook? I just wanted to share something I've been able to do when Mac OS X locks up (at least when the GUI does). I don't have Escape Pod installed and don't think I could remember the key combination to get it to work. I press the power button (this is on my iBook) and then press "r." This causes my iBook to restart. It is not a forced restart, as it is a command that is sent to the OS to do so. Therefore, it is safer than a forced restart and allows you to start over fresh (just in case there really was something wrong down below - well, at least it frees up memory when things get slow). I've noticed problems when I wake my iBook from sleep. It usually involves adding/removing a USB cable or the power adapter. Thanks for the useful tip. Definitely sounds like the first thing to try before going the Command > Control > Powerkey forced restart route. However, you should not be experiencing frequent freeze ups in OS X. I can count on the fingers of one hand the number of times I've had that happen over nearly two years of use (not counting two or three kernel panics). I think you're probably on the right track in suspecting a USB issue. The few kernel panics I've had with my iBook seem to have been related to external USB devices. The setup I'm using now is a Keyspan externally powered USB hub with everything except my dictation software headset plugged into it. Before putting the iBook to sleep, I cut the power to the USB hub, and switching the hub back on signals the 'Book to wake up. This seems to work well, and I've had no sleep/wake up problems or other issues like kernel panics since upgrading to OS X 10.2.6 a couple of months ago. I should be the proud owner of a 12" AlBook as soon as tomorrow. I ordered it loaded with RAM right away, but I am wondering if a 1 GB module for the 12" AlBook will be available soon, so we can break the 640 MB barrier. Congratulations on the new 'Book. I had somebody bring me a WallStreet G3 with this same problem (backlight remains off when coming out of sleep) [mentioned in last September's PowerBook 1400 Woes, Sleep of Death, Older PowerBook Value, and More]. After trying a PRAM zap and a PMU reset, I found several references to Alsoft's DiskWarrior fixing this problem. Sure enough, I ran Disk Warrior 2.1, and it stopped doing it. Cool!. Now that's a painless fix. DiskWarrior is a wonderful utility. I just wanted to point something out to you about your Plus. A year or two ago, I saw a Mac Plus with all the extras (same serial numbered box, original manuals, etc.) go for over $500 on eBay. I haven't been up on such things in the last year or two, so I don't know the current market. It wasn't the Plus; it was the complete package in good condition that garnered the price. The Plus by itself is worth virtually nothing on the market. Thanks for giving me that frame of reference in pricing, albeit a couple of years back. I would probably take less than $500 for the old Plus, but it's nice to know that the complete package does make it worth something. Hey, I just read your article on the Plus. I would love to own one!! I am a 16 year old, and just bought my own first Mac. It is a Power Mac Blue G3 300. I got into Macs around last year when I had a computer class and had to use them; after that I fell in love and now have my own. When I was in elementary school, I can remember using them in my second grade class. I am fairly new to Macs and would love to start a collection! I don't know where Nova Scotia is, but I would like to buy it. I only have $80 dollars now; I don't know if that is enough. Please get back to me. Glad to hear that you're enjoying your B&W G3. 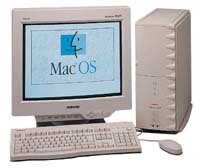 One of the great Macs of all time. As for the Plus, I deduce from your email header that you're somewhere on the US west coast. You can find Nova Scotia by checking for Maine on a map of the US - and looking a little farther east. It would probably take the shine off your 80 bucks just for shipping, and it would take somewhat more than that to get me interested in letting it go. Thanks for your interest. I am a newly found Mac addict, I have gotten in order an LC, PowerBook 1400CS, and now a Lombard 333. I have loved and taken care of all of them, although I gave the PowerBook 1400 to a friend who wants to get into Macs. Currently, I have very little money, I could spend at the most $50 total. I would really like to have this. If I can't, that's understandable. Unfortunately, $50 would maybe cover just the shipping, depending upon where you are. I, too, have a Mac Plus and have been wondering what to do with it. I'd be curious to know what kind of response you get from your article. I also have a Mac IIcx with the 13" color monitor that came with it, plus the first Radius Pivot monitor, which was ultra cool when I got it back in the late 80s(?). I would hate to have them sent off to the computer recycling (alias destruction-of-something-that-still-works) center. I'm unlikely to use them myself and don't quite know where to go with them. Well, as you can see above, offers of $50, $80, and an anecdotal account of one going for about $500 on eBay. Perhaps eBay is the avenue we both should pursue. I cannot connect to firemail.de [mentioned in the June Free POP3 Email Services article] POP server using Outlook. Even when I do what is asked from me, I get a response from the server which says my password is incorrect. You mention in your article that we need to activate to use its POP server. I checked every part of its settings, but I couldn't find. I'd be glad if you help me on the problem? After that, a POP3 email client should work. FireMail is working fine for me in Eudora, Nisus Email, and Mozilla ThunderBird. Outlook is a mediocre and buggy email client, and if you have no compelling reason to use it, my first suggestion would be to try switching email clients. I had one of those too. I upgraded it to a G3 400 with a Sonnet processor upgrade. It has over 300 MB of RAM and a PCI USB card. I got the USB card because the standard keyboard/mouse port broke. (Well, one of them broke at the time, and I wanted both to work). So I got the USB upgrade and plugged in a new black USB Mac keyboard and laser mouse. One lousy problem is that you can't use the keyboard while starting up so that extensions can be off or so that a boot from CD is possible. Enter the next problem: I gave the machine to my brother when I got a new Quicksilver 2 x 800 machine. He ran it fine for a while, until a short while ago. It quit booting all the way. It just boots up half way and then stalls out and sits there. We tried disconnecting the hard drives and booting only from CD - no luck. We tried booting from an old OS 8 floppy - no luck. It does the same thing. It just won't finish booting no matter what. Now he has a big paperweight on his hands. I seem to remember a little reset button inside, but I'm not sure if this model has it. Anyway, if you or your son have any suggestions, please let me know. I live in Redwood City, CA, but my brother has the machine in New Orleans now. Sorry to hear about your S900 problems. Yes, I use a USB keyboard sometimes with my S900, but I keep an ADB 'board plugged in, too, for startup routines and force quits if necessary. The S900 does have a CUDA reset switch, which is located on the back end of the motherboard low down beneath the PCI slots. It would be worth a shot to try tripping it. When one of these old Macs won't boot from a disk tools floppy, something is definitely wrong. These rigs are too old to spend any serious money on, but if your brother is happy with the S900 other than the boot problem, the cheapest, easiest, and most satisfactory solution might be to just pick up another S900. Baucom Computers has some listed for $69. In regards to Connie's problem with her 7500 and G4 upgrade, the documentation for these cards recommends that the original cache be removed, as they don't work well with them. I don't know if it was removed before the previous upgrade, but I had serious problems with my 7500 locking up after a while with a PowerPC 604e card at 150 MHz (original was PowerPC 601 at 100 MHz) and the original cache installed. I did try removing memory and all that, but that was my problem. I just wanted to make sure that this had been eliminated. I don't think anyone mentioned that before, so another potential piece of the puzzle. "The only thing that pulls me towards Apple notebooks right now is OS X, not any significant hardware superiority." The software has always been Apple's strong point, not the hardware. I wouldn't worry too much about whether they're using G3 or G4 or G5 in laptops, so long as the software is there. I agree. The point of the Mac is the Mac OS. The coolness of Apple hardware is icing on the cake. If a 1 GHz (or probably soon 1.2 GHz) G4 isn't enough for you, then you have extraordinarily demanding needs. I find that a 700 MHz G3 is fast enough for me right now. I'm not really a power user, but I'm a heavy user, and while extra speed is always nice, I don't find myself waiting for this iBook very often. That cable [mentioned in The Next G3, Emailer vs. Spam, Mac OS 9 Stability Tips, USB Voodoo, and More] sounds like one that came with a credit card scanner that came with a POS (point of sale) system. The larger 25-pin connector would go to the "main" POS terminal, the smaller DIN cable to the actual scanner, and the RJ-connector (RJ-11 (4-wire) is used for telcom, RJ-45 (8-wire) is used for ethernet / serial connections) went to another POS terminal. I may be wrong, but that is what is sounds like to me (and the only thing similar in my experience). Hopes this helps to solve the mystery. Thanks. Sounds like that may be it. Letters sent may be published at our discretion. Email addresses will not be published unless requested. If you prefer that your message not be published, mark it "not for publication." Letters may be edited for length, context, and to match house style.